People of Brighton (and environs), I have a reminder for you. Did you know that there is an open device lab in the Clearleft office? That’s right! You can simply pop in at any time and test your websites on Android, iOS, Windows Phone, Blackberry, Kindles, and more. The address is 68 Middle Street. Ring the “Clearleft” buzzer and say you’re there to use the device lab.. There’ll always be somebody in the office. They’ll buzz you in and you can take the lift to the first floor. No need to make a prior appointment—feel free to swing by whenever you like. There is no catch. 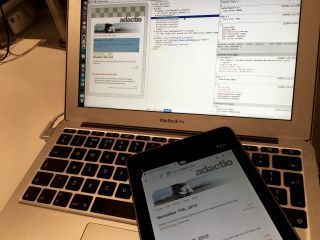 You show up, test your sites on whatever devices you want, and maybe even stick around for a cup of tea. Plug the device into a USB port on your laptop using a lightning cable. 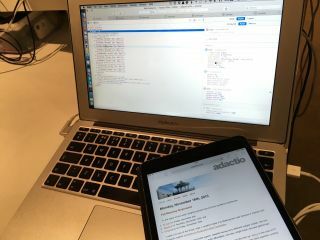 Open Safari on the device and navigate to the page you want to test. Open Safari on your laptop. From the “Develop” menu in your laptop’s Safari, select the device. Use the web inspector on your laptop’s Safari to inspect elements to your heart’s content. Plug the device into a USB port on your laptop. Open Chrome on the device and navigate to the page you want to test. Open Chrome on your laptop. Type chrome://inspect into the URL bar of Chrome on your laptop. On the device, grant permission (a dialogue will have appeared by now). Use developer tools on your laptop’s Chrome to inspect elements to your heart’s content.